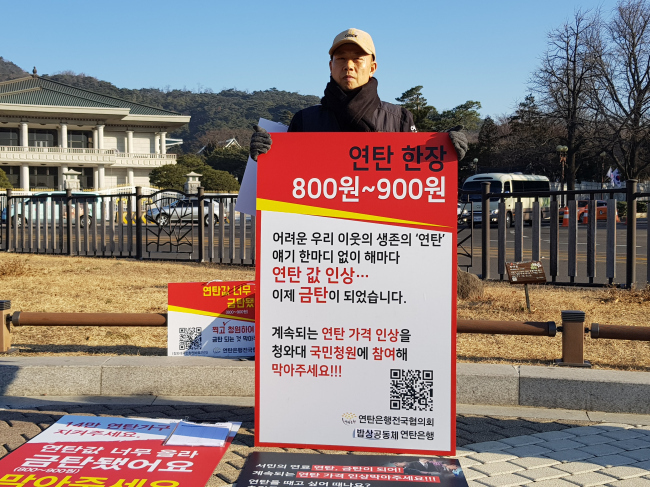 The leader of a welfare group that offers coal briquettes for heating began a one-person protest against a briquette price hike in front of the presidential office Monday. Heo Ki-bok, chief of the Babsang Community Foundation and Briquette Bank, started what the group said would lead to a series of one-person protests by other members of the foundation. In an online petition filed on the Cheong Wa Dae website on Dec. 13, the group said the price of coal briquettes, known locally as yeontan, went up 50.8 percent -- about 300 won ($0.27) -- in the past three years, increasing the burden on low-income households that still use them. The consumer price for yeontan is now 800 won, but they are sold at 950 won or 1,000 won when including delivery fee in hillside slums and remote areas in the provinces, the group said. Heo said that his group needs to deliver more than 7 million yeontan nationwide, but is unlikely to receive enough donations to pay for 5 million. “Yeontan is an energy for survival for the have-nots, including the elderly,” the group wrote. The group said it will hold a press conference on Feb. 11 and deliver to the presidential office the results of its campaign to collect signatures to withdraw the price increase. City and county councils across the nation have adopted resolutions for the same cause. The city council of Wonju in Gangwon Province, county councils of Yeoncheon in Gyeonggi Province and Wanju in North Jeolla Province adopted the resolutions this month. More local councils are set to follow suit in January.